But it is the amount of public land and trails along M-22 that is remarkable. The highway passes through the heart of Sleeping Bear Dunes National Lakeshore, the state’s most popular national park with 71,000 acres of public land and 35 miles of beaches. 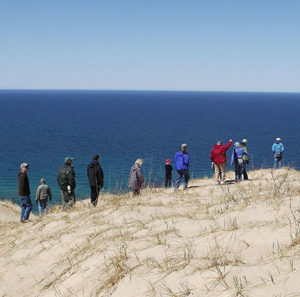 It is also the gateway to more than two-dozen preserves protected by the Grand Traverse Regional Land Conservancy in Benzie County and the Leelanau Conservancy in Leelanau County. 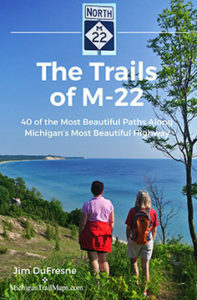 The Trails of M-22 is the first guidebook dedicated to leading you away from the pavement and into the dunes, forests and wetlands seen along 40 of Michigan’s most beautiful trails, including all the mainland trails in Sleeping Bear Dunes National Lakeshore. The paths reward the adventurous with remote beaches, shoreline shipwrecks, outstanding birding opportunities and panoramic views that make you feel like you’re on the edge of the world. 192-page book features outstanding photography and more than 40 trail maps. 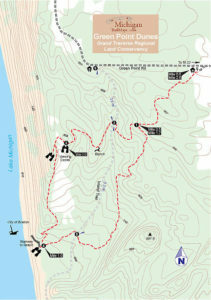 Larger, more detailed versions are available from MichiganTrailMaps.com (www.michigantrailmaps.com) and can be downloaded to smart phones and tablets or as PDF files to be printed later.